The Restaurant Mystery Shopper market has grown to eclipse 1.5 billion dollars in recent years growing at around 10% annually. But in talking with C-level executives in the restaurant space we see an industry ripe for disruption. Traditional mystery shopper programs may not be around much longer. With the advent of the smart phone and the ubiquity of messaging today, this channel now becomes the medium in which retailers want information from their guests. Let's unpack some of these common complaints. This is a common gripe in and around mystery shopper programs. Although mystery shopper reviews tend to be extensive, most restaurants can only afford to do one or two per store per month. 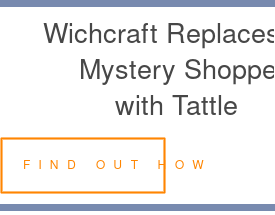 Because of this, mystery shops are by nature very subjective. A business is relying on the expertise of one individual and is seeing a snap shot of one moment in time. If the restaurant is chaos at that moment the review implies disorder all the time. It's just too limited to draw an extensive view of what is going on day-in and day-out. This is an interesting argument that exists throughout the industry. Some restaurants like the fact that mystery shoppers are auditors rather than customers. There is definitely value to having someone with an eye for inspection writing reviews. But customer feedback, although less expert, can be a much better gauge of the operational efficiency of an organization and the overall customer experience. Customers are ultimately the life-blod of every organization. And if one customer is unhappy with an experience than other customers are as well. Hearing from your customer-base about things that are wrong is better than seeing it impact the bottom line. Restaurant shopper reports often follow a similar script. There are a certain amount of questions that need to be answered and so a restaurant shopper will ask the same questions. Because of this, restaurants have learned to figure out when a mystery shopper is standing in their store and make sure they get great services and therefore impecable scores. As a waiter, I knew I was being mystery shopped and told my manager as such.